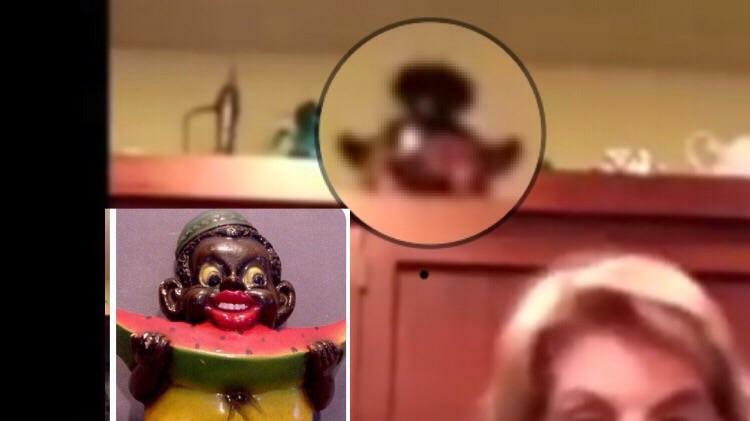 A few weeks ago Democrat Party Presidential primary candidate, Elizabeth Warren, posted an on-camera communication event in the kitchen of her home. 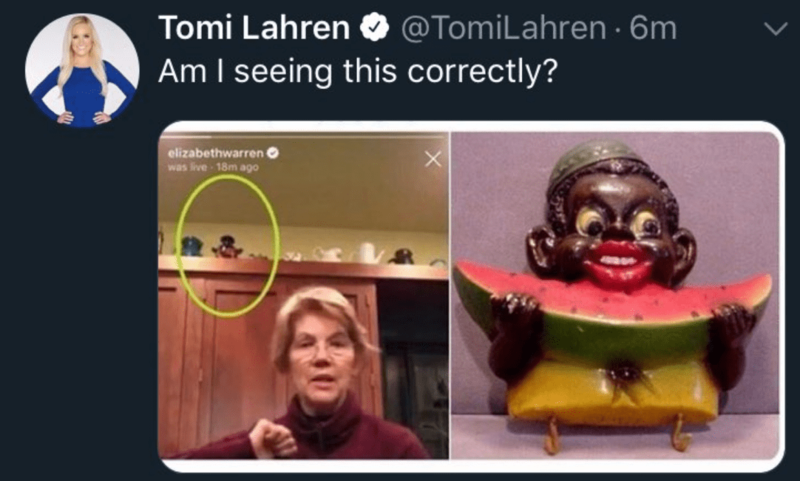 within a matter of hours, what you see below-found its way across the Internet, and onto the willing desks of Fox News host Tomi Lahren. If you need a closer look, check it out via Snopes dot com. Upon seeing the images, my perception of the image was a photoshopped copy. Warren not only wouldn't own such an item. Moreover, she nor anyone working a camera would allow it to become part of the video. My mind immediately moved to the obvious level of intellect imbued in the person who would create such a propaganda item and to create the item with such an obviously dumb effort to impart a message. Suspicions based on years of watching such garbage serve as feed to American racist and those who are targets of political dirty tricks. And deep down, my mind also went to Russian Internet operatives, as even the US right replete with racist galore would probably not create such a dumb depiction. Before moving to news of yesterday related to the probable source of the racist statue, here is a link to the Snopes review of the matter. MSNBC's Rachel Maddow hosted a segment about growing evidence of continued election tampering via Putin's Internet army. The message is clear. Russians helped Donald Trump win the 2016 election; Putin's Internet army is again as busy as ever working to turn voters against top Democrat Party Primary candidates. Television viewers, readers and partakers in US social media be aware. Early this morning President who seems to be losing much sleep fretting unfolding details about Russian hacking and possible connections to his campaign (including close family members and lawyers) awakened with a focus on offering deflection from his vulnerability to a past president. We can only assume he visited his White House living quarters restroom before going with the following tweets. Tapes? Trump would dare mention "tapes?" I remind of Former FBI Director Comey and lies about Obama wiretapping Trump Tower. Maybe he feels comfortable using "tapes" based on the evidence he has about former President Obama's birth certificate from his Hawaiian investigation team. Wo have tape and it comes straight from Trump's campaign carnival barking in 2016. Whether former President Obama "choked or didn't choke he made a calculated decision based on the thought that Clinton's was ahead in the election polls and he, as a person of haharacter and a person with love of the US COnstituion, did't enact measures woch could have led to a Russian cyber Thermo0nuclaer) attack on the 2016 elections. From Russia With Love, to our completely inept president. Once we get passed the reality the GOP did not want any form of national healthcare laws, we can look at how they resisted the Affordable Care Act. In 2010, current Senate Majority Leader Mitch McConnell said: "Democrats on Capitol Hill are working behind the scenes on a plan aimed at jamming this massive health spending bill through Congress against the clear wishes of an unsuspecting public." Trump's Health and Human Services Secretary Tom Price, then representing Georgia's 6th Congressional District, said Democrats were "sacrificing the trust of the American people." Twitter Ads info and privacyHe also told CBS News in 2010: "The negotiations are obviously being done in secret and the American people really just want to know what they are trying to hide." It is also critical to recall a very wise person once advised against accepting GOP rhetoric as it relates to federal aid to people who most need the aid. Putin's Foreign Minister meets with Trump no reporters allowed. A Russain foreign Minister hanging-out in the Oval Office and a top Russian spy in the US (diplomat) hobnobbing with Trump. Will White Nationalism Completely Engulf Conservative And Independent America? 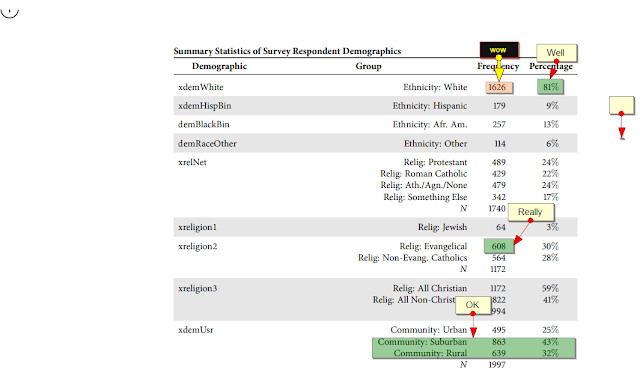 Last fall through this past week, multiple media, and social media reported on growing white supremacist support for Donald Trump's primary campaign. A number of white supremacist groups have publicly endorsed Donald Trump's run for the presidency, and Trump isn't discouraging them. While the growing affinity for a GOP candidate who campaigns with bigotry, racism and public mocking of the physically challenged may not concern you, your comfort zone will receive a Trump rattle as narcissism and elitist insensitivity reaches outside of his inner family (and most white people). Paul Ryan, House Speaker, spoke out against Trump's talking of banning Muslim entry into the United States. The RNC Chair, Reince Priebus, spoke in a tacit manner about Trump's remarks, effectively took 'the fifth" on requests to comment on Trumps racists proposal. All GOP primary candidates have commented on Trump's proposal. Rand (Ron Paul's son) Paul even reached to affiliate with Trumps remarks via his comment about his "similar" proposal. Party response to Trump's remarks to Trump's comments has been very measured; probably with, in their minds, good cause. The party has a full lock on a voting bloc that can be subscribed only as the white nationalist vote. The fully metastasized white nationalist vote has been careful developed and nurtured since Barry Goldwater's and Richard Nixon and Kevin Phillip's mid-to-late 1960s southern strategy. Not only can the GOP comfortable count on the US south and the Plains States as slam dunk electoral votes, the well-honed strategy has given rise to the a shifting national paradigm of *it is OK to express bias, bigotry and overt racism*. A paradigm shift that picked up steam with Ronald Reagan's political operative: Lee Atwater. The Nation, immediately after Mitt Romneys loss to President Obama. A party that has carved out a major swath of voting support which reaches back to the antebellum south has now evolved celebrity kingpin to lead a crusade, refuses to either full embrace a shameful reality or comprehensively refute the reality. If you have a few minutes skip through the following video, watch as MSNBC's Thomas Roberts and GOP shill Michael Steele gloss over the proliferation of support for Trump from white supremacists. Robert's openly states Trump's August remarks distancing himself from David Duke's public support, but he carefully crafted a question to Steele that was as easy to skip around as avoiding stepping of sidewalk gutter drains (the 2:33 mark to the end of Steele's talking head gibberish). Could the corporate cautiousness from MSNBC have in some way fulfilled an obligation to report via the quotes from Duke and Black, while pulling up (politically) shy of real comment about the matter? While MSNBC producers and writers fulfilled a responsibility to report on Trump's growing support from white supremacists, network management should be taken to task for failing to properly report the full impact of Trump's candidacy and the harm it will bring to our nation. The white racist fringe of American politics is a fragmented one, where attitudes toward Trump range from full-fledged embrace to cautious optimism to skepticism. Black of Stormfront said Trump's rhetoric has been a boon to white nationalists. “He has sparked an insurgency and I don’t think it’s going to go away,” he told POLITICO of Trump. White nationalist set the path for sympathetic and gullible Americans to follow via the use of the word "insurgency". What message does the word send to all too willing militia Iraq action with Concealed Carry laws and in some states Open Carry (weapons) laws proliferate? The word "insurgency" isn't synonymous with peaceful actions towards change or, for that matter, regression. Ben Carson as an innocent victim of US media (other than Fox News)? Really? Before we move to recent comments from noted conservative conspiracy mogul, Monica Crowley, it is important to peruse a few comments from Ben Carson. It is important to state, not one of the Carson mental/oral foibles involved edited video tape. As the following strategy from the Right unfolds recognize Carson is handing media all it needs to fill hours of coverage (observation, analysis and reporting). While many will cover for Carson with comments about his "different and avant-garde" comments, the problem is much deeper ad significantly more serious. He aspires to be President of the United States. Regardless of one's perspective from any the opposite realm of perfectly balanced, his comments reveal thought processes which are so far outside the norm. He cannot be trusted to effectively lead. His words are manifestations of cognitive processes that are yielding communication that leads to either head-scratching or attempts to defend his words. Let's watch and listen as Bill (Mr. Cover It) O'Reilly and Monica (Allow Me To Conspiracy It) Crowley fills their conservative mission. But, let's do so with one leading thought: No one is forcing the words from Carson's mouth. Despite a miniscule census of a meager percent of African-American who claimed the GOP, the party has placed a "Whites Only" sign as a de facto moniker. In the eve of overwhelming House chamber support for an Israeli leader, GOP leadership boycotts an important celebration and commemoration of US History. Some in the nation simply do not "get it." We continue to show astonishment at horrific examples of overt racism and we seem to accept conservative America has no interest equal rights, civil rights and human rights. Many actually live in a false reality social bubble as secure as Fort Knox. They actually believe America is about "we the people" with all Americans treated equally and with equal opportunity for all. These people are actually a danger to the greater society as they provide a naivete laden well plowed and fertile field for political operatives who manipulate issues of race for political gain. They are so inclined to live as stooges for GOP Southern Strategy dogma, they have paradigm(d) into a mindset of social conservatism at the expense of self-preserving rationalizing thought. In order to find Right-wing dogma palatable, one has to have developed a mindset that is the antithesis of old America. If you need an example of dogma from the Right look closely at these two images and very shot video. President Obama's State of the Union Address is an unrivaled illustration. Note the boredom, the cell phone use, folded arms and obvious looks of contempt. Fast forward to this past Tuesday as the Israeli Prime Minister delivered a veritable call to war while feeding GOP obstruction against a sitting US president. The Republicans in Congress may have offered applause when President Obama spoke of and honored the husband of former Congresswoman Gabby Gifford's and his future stay on the international space station. They also may have offered perfunctory applause when Obama poke of his proposed trade agreement. The point of my reach back to the SOTU relates to irrational dogma from the Right. It doesn't take an over exercise of your grey matter to know that Republicans at the SOTU would have applaud each item bulleted above if the White House was occupied with Republicans. Of course, my point is a bridge too far, as no Republican would have mentioned the items above. But, the reality of the two events shows very poorly for the GOP and now joins developing Obama history as president. ...we are reading reports of a from of protest from the GOP. Politico reported on the obvious "message" absence of all GOP leaders at this Saturday's historic commemoration. Why anyone would be surprised at the message absence befuddles me? Take look at a most brazen exhibit of contempt for the American Black Community. 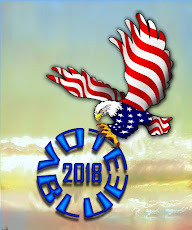 First an image from the Mitt Romney website that was to have been posted to the Web the morning after his victory over incumbent President Obama. The following is not a whimsical meme, it was captured in the early morning hours after Romney's concession speech. The image above could have become an archived we posting and set the stage for the Romney inauguration with the following looming in the shadows. As you view the web posting from Romney's webpage, think about a word posted above: "message." Did you notice the extent of Romney campaign outreach? 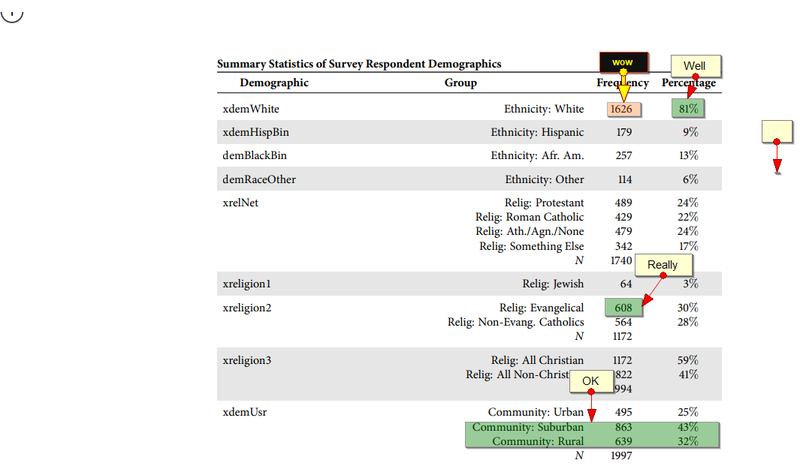 Maybe, I should ask more specifically to ward-off personal embarrassment: "Did you notice Romney's website message the Black Community via egregious omission of any linked outreach?" If Romney and his team chose to overtly ignore 13 plus millions US citizens, should we actually expect current GOP leaders to offer a difference face? The GOP is a party of 9 to 892 whites for a reason. The party is so anti-minority of late any GOP leader who might have attend the event would probably suffer irreparable damage to HIS standing in conservative America. As a minimum the rational person would think House Whip Steve Scalise would attend to offset revelations of his hobnobbing with white supremacists as a state official in a past life. The message is clear! Despite a few well compensated black mouthpieces who lavish copious praise on the GOP while sitting quietly as conservative America shows its increasingly and racist underbelly, the GOP remains a relic of our segregationist past. A past the GOP clearly has no interest in staking-out an opposite position while sending a positive forward message.